Heritage Training and Shooting Center provides courses developed by the National Rifle Association(NRA). Whether you're looking to take your first shots, or become a NRA certified instructor the NRA has the course for you. NRA courses are designed and developed by experts in the field to help you learn the basics and hone your shooting skills. Becoming a NRA Instructor will not only qualify you to teach NRA Basic Level Courses, but also to become a Maryland Certified Handgun Instructor. NRA Certified Instructors will provide you the knowledge and skills to safely use a handgun through this Instructor-Led Training. This training will be conducted over two 4 hour sessions at Heritage Training & Shooting Center. 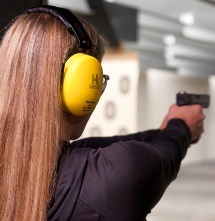 On the range, you will complete live fire training and a nationally standardized shooting qualification course. Firearms and ammunition will be provided and are included in the course fee. Upon completion of the course, you will receive a course completion certification bearing the signature of the NRA Secretary and your NRA Certified Instructor. Please Note: This course is a prerequisite to taking the NRA Instructor Pistol Shooting Course. *When registering select the first day of the course you wish to attend. Please note that you must attend both days of training to receive NRA Certificate of Completion. This 16-hour course teaches the knowledge, skills, and attitude essential to organizing, promoting and teaching NRA's Basic Pistol Shooting Course. This training will be conducted over four 4 hour sessions at Heritage Training & Shooting Center. NRA Training Counselor will present the course in two parts: basic instructor training, and discipline-specific instructor training. You will learn the policies and procedures for becoming an NRA Instructor as well as effective teaching methods for training students. All courses include the required NRA documentation, instructor guides, student packets, instruction and follow-up support. You will receive everything needed to teach the NRA Basic Pistol Shooting Course. On the last day of the course, students will shoot a 100 round live fire exercise using the handgun of their choice. *When registering select the first day of the course you wish to attend. Please note that you must attend all days of training to receive NRA Certificate of Completion.